The shower is one of the places to freshen up and get ready for the day, but the water pressure is equally important if you are looking to have a decent shower experience. While choosing one for the average person will depend on factors like the style and the functionality, a high-pressure shower head is actually much more intricate. Who are these showerheads for you ask? – The high-pressure showerhead is for any person looking for a great shower experience. It makes washing your head and rinsing it down that much easier and it eliminates any problems caused by things like bad municipal water pipes. Since choosing the right one is so tough, we have decided to do some research and get our hands on a couple of these showerheads to test them and see which ones are the best high-pressure showerhead 2019. We have also included a decent buyer’s guide that should help you when it comes to choosing a different high-pressure showerhead and get more value for your money. 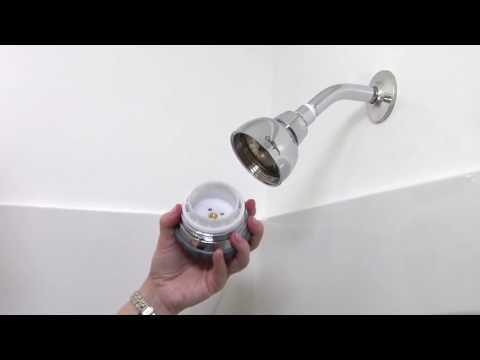 What is the Best High-Pressure Showerhead in April, 2019? Which One Will You Choose to Enhance Your Showering Experience? Before we dive into the features that make these showerheads special, you should have a basic understanding of how they look and which ones are the best. Since you might not know where to start, we have selected the top 10 to get you started and ensure that your first option is definitely top quality. Speakman S-2252 Solid Brass 1.75 - 2.5 GPM Crome / Satin Brass / Brushed Nickel / Oil-Rubbed Bronze / Polished Brass / Polished Nickel / Matte Black 2 3/4 in Spray adjusting handle, 6 plungers, 48 sprays 1.2 pounds 120 PSI 1 year Check price! Hansgrohe 27474001 Brass 2.5 GPM Chrome / Brushed Nickel 10 in AirPower Technology, Showerhead rotates 26 degrees in any direction 3 pounds - 1-year Check price! Vida Alegria 5-Inch Plastic 2.5 GPM Chrome 5 in Solid brass connnector and ball joint 5.6 ounces 120 PSI 3-year Check price! A-Flow™ Showerhead Plastic - Chrome 6 in Features five functions 15.2 ounces - - Check price! Culligan WSH-C125 Plastic 2 GPM Chrome - WHR-140 filter cartridge 1.58 lbs - 2-year Check price! Waterpik TRS-523 Plastic 2 - 2.5 GPM Chrome 3-1/2 in. OptiFLOW technology 3.2 ounces - Limited Lifitime Check price! Delta Faucet 75152 Plastic 2.5 GPM Chrome 4 7/16 in Adjustable H2OKinetic, 360-degree spray angle 12.3 ounces - Lifetime Warranty Check price! Aqua Elegante 6 Plastic 2.5 GPM Chrome 4 in 6 different settings 7 ounces - 5-year Check price! Aqua Elegante 3 Plastic 2.5 GPM Chrome / Brushed Nickel / Oil-Rubbed Bronze / Polished Brass 3 in 36 nozzles for higher pressure 5.4 ounces - 5-year Check price! CLOFY 6-Setting Plastic 2 GPM Chrome 3/4 in Angle-Adjustable; Massaging & Pause 5.8 ounces - 10-year Check price! Made from brass and polished chrome for added style, the Speakman S-2252 is one of the more durable showerheads on the market today. The showerhead will not only last, but the style should also be perfect for any bathroom and fit in. It is available in the 2.0 and 2.5 GPM versions depending on the pressure you need and while the 2.5 is the highest pressure, 2.0 GPM is ideal for any home. The Anystream 360 technology allows you to use the showerhead at any angle and move it in the direction you need it to be. It is equipped with 6 different jets and 48 sprays for a more efficient shower experience. One of the things we really appreciate about this showerhead is the ability to clean itself and the plunger you can use to take all of the dirt out of the showerhead. It also fits standard U.S. plumbing connections and this minimizes the need to make any adjustments to your shower. Finally, it is available in multiple colors and styles. The price of this showerhead is actually quite expensive, but it is rated as one of the top showerheads on the market today. It comes with a limited lifetime warranty and we would definitely recommend it to anyone looking for something new and impressive to improve their showering experience. The Hansgrohe 27474001 Raindance is one of the largest on our list and it features the down pouring feature many people find attractive. The head is almost 10-inches wide and it is made from durable brass with a stylish nickel finish to fit your bathroom décor. The showerhead features 2 different modes that can be selected depending on the mood that you are in. It includes the QuickClean feature to ensure that you need not spend hours when it comes to cleaning it yourself and this should ensure the showerhead never becomes clogged with limescale buildup. The AirPower technology is something new being incorporated and this will allow the water to feel like little rain droplets falling on your skin during a shower. It also makes the skin softer after prolonged use. Unfortunately, it is one of the more expensive showerheads on the market today and will be perfect for those with large showers. If you are looking to save water, the Vida Alegria 5-Inch is an ideal option. It is also chrome polished to add some style and it is made from silicone jets that can simply be flipped open if you need to have it cleaned. Solid brass has been used as the core material, providing you with excellent durability. The most impressive feature of this showerhead is the 5 spray modes that it features. This allows you to choose the style you need to accommodate the mood you find yourself in. Many of these modes can also be mixed if you are looking for something new and the 2.5 GPM pressure is quite impressive for something so affordable. The only thing you should know about is that it might not be ideal for wider showers and the spray seems to be a little narrow to reach some of the larger showers. The brand also sports a great reputation when it comes to providing their clients with some great customer service and helping out if you have problems. It might not have the longest warranty at only 3-years, but when looked after, this showerhead should last you multiple years. It is one of the more affordable models on the market today and we would definitely recommend it to anyone looking to enjoy a great shower experience at an affordable price. Next, we have the A-Flow™ Showerhead, which has also been designed from durable brass materials and features a wider 6-inch head that should reach your larger showers much easier. It works with universal parts found and used by most plumbers around the U.S. and this should make the installation process that much easier. This shower head also comes with 5 different spray modes, all designed to provide you with the best possible showering experience. The ABS feature allows you to pause the shower at any time to ensure that you are capable of thoroughly washing. It also comes with a 360-degree swivel ball that allows you to move it in any direction. The installation process is the fun part of this showerhead and since it is so easy to install without any tools, you will be inclined to do it yourself. It is also one of the more affordable showerheads on the market today and while it does not come with a warranty, it should last you a long time if it is looked after with care. The Culligan WSH-C125 is another stylish showerhead that can be wall mounted with ease. It shoots out around 2 gallons per minute when at its very maximum level and requires virtually no troubles and tools to perfectly install in your shower. The WHR-140 filter is included and placed inside the showerhead and while this does offer some effectiveness when it comes to filtering sulfur and other bad substances out of the water, you will still need to clean this filter or your showerhead might start clogging and cause significant damage in the long run. The showerhead also comes with five different settings that can be changed to meet your needs, but as we have mentioned, if the filter is clogged, it could cause a problem or two. The company also claims that the showerhead is capable of softening your hair and skin, but this will only be the result of using it for prolonged periods. It has been reasonably priced and we would definitely recommend it to anyone looking for a new showerhead. It might not be the number one option when it comes to living hassle-free, but you will only need to change it every 6 months. This showerhead is also backed by a limited 2-year warranty to give you peace of mind. The Waterpik TRS-523 is one of the cheapest shower heads you will find on the market today. It comes with OptiFLOW technology to ensure a decent spray setting. It is quite durable and does come with an anti-clog design, which means that you only need to clean it every now and again. Much like the other showerheads, this one is also quite easy to install and you will not need to use any additional tools. It fits the most standard U.S. plumbing connections and also meets up to all the standards. We love the five different settings it comes with as well to ensure that you have an epic shower experience every time. The downside to this showerhead is the fact that it is fixed and you will not have any way of moving it in larger showers. It also lacks some durability and after a while, it might also start dripping and leaking, which could provide some problems. For the price, we would definitely recommend it as the number one budget option on the market today. 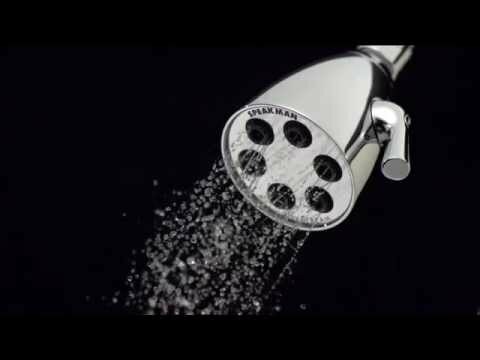 If you are looking to get rid of your normal showerhead without doling out too much money, this is certainly the perfect showerhead to get you started. We would recommend this showerhead as the ideal budget option on the market today. Fits all shower connections in the U.S.
Delta is one of the top brands when it comes to producing home and bathroom equipment and the Delta Faucet 75152 is one of the unique shower heads that will not only add some style to your bathroom but also give you all the control in the world to enjoy your showering experience. This showerhead can also be installed without the need for highly advanced tools and the swivel ball is perfect for providing a 360-degree spray angle for you to enjoy your showering experience to the max. It sprays at 2.5 GPM, but this can also be fully adjusted to ensure that the pressure is perfect for every member of the family. Our biggest concern is the fact that so much plastic has been used in the design and this might not be ideal for those looking to have a hassle-free showering experience. You will need to clean this shower head every once in a while, but this is also quite easy to do. The Delta Faucet 75152 Water Amplifying Adjustable Showerhead is backed by the Delta limited lifetime warranty and this will give you great peace of mind. We would highly recommend this showerhead for the affordability and the quality of the design and it should be perfect for improving your home shower. If you are looking for an affordable and yet effective showerhead with multiple features, the Aqua Elegante 6 is definitely one of the best options to consider. It features a sturdy construction from top quality materials like hardened plastic and rust-resistant stainless steel for durability. The main draw is certainly the 6 features it offers users and this will exceed many of the other top showerheads when it comes to versatility. It features full adjustability to select the ideal pressure you feel like showering in and it can be used outdoors as well as indoors depending on the area you need. One thing we like is the fact that the showerhead can be removed and easily installed. It fits all U.S. standard plumbing connection and this could be a great benefit for those who love traveling. Now you will have the ability to take your favorite shower head along when showering in hotels. It is available in multiple different colors to ensure that you have the right one that meets your needs for your bathroom. It is also backed by a 5-year limited warranty to provide you with some peace of mind and it is reasonably priced if you are looking for something to use in the long run. We would definitely recommend it for those picky about hotel showerheads. The 3 Inch High Pressure Showerhead from Aqua Elegante features a smaller 3-inch design made from ABS plastic and durable brass. Aqua Elegante 3 has been coated with a rust-resistant coating to ensure no problems occur during prolonged use and the self-cleaning nozzles will prevent calcium buildup from becoming a problem. Much like the other showerheads, this one is quite easy to install and you will not need to have any hard tools and complications when installing the shower head. It is also available in multiple colors and styles to ensure that you have the perfect fit that meets all of your needs when it comes to the décor of your bathroom. The showerhead is quite narrow and might not be ideal for larger showers, but it does come with a peace of mind ensuring warranty of 5-years. The price is also quite affordable and we would definitely recommend this as an ideal affordable option. Last but certainly not least, we have the CLOFY 6-Setting and this is well-designed chrome plated showerhead engineered with ABS construction and ensuring that the showerhead does not become a victim of rust. The shower has also been WaterSense Certified and this means that it does not use as much water as you would expect a normal showerhead to use. The mirror-like look is also quite stylish and this should appeal to many users in the hopes of improving the style and the quality of their bathrooms when it comes to the shower area. The one downside we have found with this showerhead is the lack of durability and over time it does start to wear out. You will need to clean it often or the buildup of water chemicals might lead to a couple of leaks that could have been avoided. If you are looking for something fast and affordable to buy, this showerhead is certainly one you need not put much thought into. It is also worth mentioning that with this cheap price tag, you will also receive a decent 10-year limited lifetime warranty to offer you some peace of mind. While each person may have his or her own reason for moving on from the normal showerhead, the high-pressure showerhead is mostly designed to improve the pressure of the water. If you are constantly battling with weak water pressure, these showerheads could make a significant difference and you will have a better showering experience. These showerheads are also perfect for salons and for those traveling as they can easily be removed and replaced to ensure you have a great showering experience no matter where you stay. These are only 6 of the benefits we experienced while using a couple of these showerheads, but we believe with some more testing, you might even be able to find more if you have been using the normal showerhead for a long time. The high-pressure showerhead is certainly more expensive to start out with and this might not be something that everyone likes to hear. However, the benefits are definitely great for these showerheads and anyone using one will point out that they simply just look better and they also tend to last a little longer than the normal head. The high-pressure shower head also shifts the control in your hands and you no longer need to take a blunt shower with low water pressure just because the pipes are not working with you. These showerheads will also give you the ability to save water and since they do not clog up as often, you can save some money as well. Now that you have a better understanding of these showerheads and what they look like, you might also be wondering which features we used to judge them and choose our top 10 high-pressure showerheads. Here are the key features you need to keep in mind when searching for your own selection of top high-pressure showerheads: construction, nozzles, self-cleaning, spray options, warranty. At first, the construction does not seem really important, but if you are looking for something to last you in the long term, the construction will be fundamentally important. Brass is definitely one of the top materials and once it has been finished with chrome, you should be perfect when it comes to the style as well. Stainless steel is really affordable and might last you awhile, but as long as the showerhead is rust-resistant, you should not need to worry about any issues. Nickel is obviously one of the best coatings you could find, but it does increase the price quite significantly when compared to others. The amount of nozzles will certainly make a difference when it comes to the effect of the showerhead. The more nozzles it has, the better the spraying effect will be and while these nozzles will need maintaining to clean, you will have a comfortable showering experience. Since cleaning these showerheads can be quite a daunting task, we have decided that this feature definitely deserves a spot on our list. The self-cleaning feature will remove the need for you to take down the showerhead and clean it, which could lead to a hassle-free showering experience. However, it is worth mentioning that adding this feature will raise the price. The spray options are important as they define the entire showerhead. The more options you have, the more versatility you will also have and this should allow you to effectively shower the right way depending on your mood. We recommend looking for something with at least 5 spray options if you are looking to get more value for your money. Last but certainly not least is the warranty and since these products will be used daily and they will take a battering from the water, you will need a decent warranty to ensure that you have peace of mind. It is also worth noting that companies do give great warranties if they have great trust in their products and anything over 5-years should suffice. These showerheads are all highly recommended and we would like to stand by them all in terms of the recommendation. The, once you choose, will also greatly depend on your budget. We would like to thank you for reading this article and we would like to encourage you to tell us more about your favorite high-pressure showerhead. Please also let us know in the comment section if you think we might have missed any of your favorite high-pressure showerheads. Few months earlier, i purchased a favor Delta shower head from a nearby shower supply store and it felt completely frightful. Doing some exploration, I went over this Speakman S-2252 which I had happened to involvement in a couple of lodgings. I find that they were really not low-stream shower heads!!!! The spill out of this feels SO decent and intense – like it is utilizing much more than 2.5GPM! Happy to see you add this amazing shower head in your list. Can I use Hansgrohe showerhead with another brand mixers? What it the best way to clean chrome showerhead? On my mind soap and water is enough. Hi, what type of hose I need have to attach Culligan WSH-C125 showerhead? Hi, this showerhead connects to the pipe from the wall. Hose no needed. Where is hansgrohe shower’s made? Hansgrohe is Germany company. But I think showerheads are made at China. Does Hansgrohe shower head have different spray modes? I am very interested in buying Speakman adjustable shower head, but I don’t like the color they offer as a standard one (that is pictured). May they have any other options? I would be more than happy to see more information about colors. Welcome here! Thank you for your question. As we know Speakman shower head is available in several colors. There are brushed nickel, polished chrome (by default), oil-rubbed bronze, polished brass, polished nickel, satin brass and matte black. As you can see you have range of patterns to choose. Here you are! For Speakman shower head only 2.0 and 2.5 GPM versions available? I have very sensitive skin and I am afraid 2.0 and 2/5 will hurt it. Probably less flow rate is also available? Hello! We’ve checked Speakman authorized web-site and can inform you about this question. It is 1.75 GPM on Amazon now, so Speakman has shower heads with less flow rate. ‘Anystream technology’ sounds cool but what is it? Fine question! If you are talking about Speakman showerhead s-2252, it really has this technology. There are 3 great options: intense, rain, full flood. The intense setting provides you with the flow in which not a single spray intersects, but even though you will enjoy a remarkable flow. The rain spray setting is heavy but gentle. The flood setting is perfect for relaxing, because it is full of thick sprays that are dispersed. I have a question about Culligan WSH-C125. Can I remove the flow restrictor from this shower head? Yes, the this thing really restricts the water flow. Sure, you can remove it and we recommend removing it before installing. So that should be the first thing to do, moreover it comes with the plumber’s tape. It will save you from having remove it and install it again. The instructions come with it, you can understand it easily. It will be a piece of cake to remove. Good luck! Clofy 6-setting has ABS construction, it is something used against rust? Hi, it is type of plastic which is a common thermoplastic polymer. Its most important properties are toughness and impact resistance. It is used for many purposes (electrical and mechanical ones). It is not metal to be destroyed by rust. With new Delta Faucet I have no troubles with pressure any more! Fantastic! Before we had terrible water pressure, it was no more than a trickle, but now with this shower. I can see dramatic difference now! Happy to read this. Delta Faucets (shower heads) work really nice and many customers are satisfied with this purchase. The best thing is that you can improve the water flow just have fixed this shower head (reinstalling sanitary ware or engineering).